When Rolex supports a sport on a global level, the brand pretty much goes all out. Take yachting for example. Rolex has been a part of the sailing world since 1958 when it partnered with the prestigious New York Yacht Club (NYYC). Fast-forward to today, and Rolex is the title sponsor of a whole host of yachting events, such as the TP52 World Championship taking place this week in Cascais, Portugal. Come aboard as we explore the relationship between Rolex and yachting. From North America to South America, from Europe to Asia to Australia, Rolex has most of the continents covered in terms of partnerships with races and regattas. There’s the Rolex TP52 World Championship, the Rolex Sydney Hobart Yacht Race, the Rolex Fastnet Race, the Maxi Yacht Rolex Cup, the Rolex Swan Cup, and the Rolex Giraglia. Plus, there’s also the Rolex Middle Sea Race, Les Voiles de Saint-Tropez, the Rolex China Sea Race, the Rolex New York Yacht Club Invitational Cup, the Rolex Big Boat Series, and the Rolex Circuito Atlántico Sur. There simply isn’t another luxury watch brand that comes close to Rolex’s support of yachting and sailing around the world. Along with event partnerships, Rolex also has long-standing relationships with some of the world’s most prestigious yacht clubs. Starting with the New York Yacht Club (NYYC) in the 1950s, Rolex now counts Royal Yacht Squadron (RYS), Yacht Club Costa Smeralda (YCCS), the Royal Malta Yacht Club, the Royal Hong Kong Yacht Club, the Société Nautique de Saint-Tropez, the Yacht Club Italiano, and the Yacht Club de Monaco as friends of the brand. What’s more, Rolex even organizes their own annual Rolex World Sailor of the Year Awards. These awards honor the top male and female sailors. 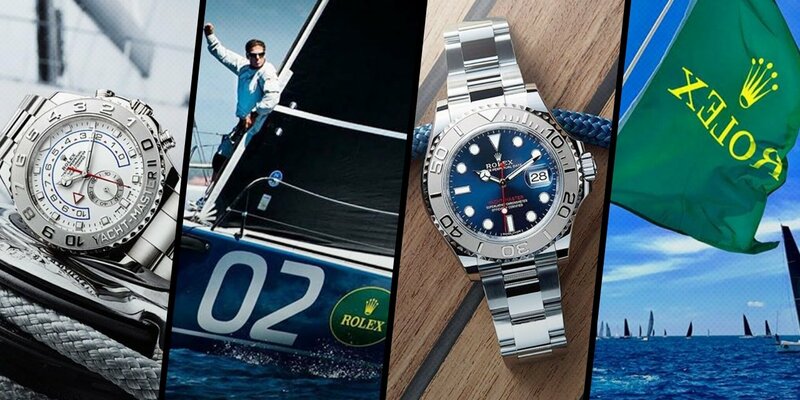 Official Rolex brand ambassadors include seven-time World Champion Sailor and Olympian, Paul Cayard, in addition to 13-time World Champion and five-time Olympic medalist, Robert Scheidt. Rolex’s association with water dates back to 1926 when the company presented the world’s first waterproof watch, the Rolex Oyster. Since then, Rolex has focused on improving the water resistance of the famed Oyster case. As such, plenty of their watches strike the perfect balance between robustness and luxuriousness. Rolex boasts not just one, but two watches dedicated to the nautical life. The Yacht-Master and Yacht-Master II are some of the most recognizable in the brand’s lineup. The Yacht-Master made its debut in 1992 and offers plenty of sporty luxury watch options for both men and women. There are the solid yellow gold Yacht-Master watches, the steel and platinum Yacht-Master watches, and the two tone gold and steel Yacht-Master watches. Furthermore, as of 2015, Rolex unveiled Everose gold Yacht-Master watches fitted with the brand new black Oysterflex rubber bracelets. While the Yacht-Master watches are super stylish and functional watches, the Yacht-Master II collection offers a line of large 44mm tool watches built specifically for competitive sailors equipped with a regatta timer. Available in steel, yellow gold, white gold, and two tone steel and Everose gold, the Yacht-Master II is one of the newest watch collections from Rolex with its starting point in 2007. It’s clear that sailing is a big part of the Rolex spirit. In turn, the Swiss watch brand is a significant player in the yachting world. However, lucky for us non-sailors, the partnership has inspired plenty of fantastic Rolex watches that can be enjoyed by those even beyond seafaring circles.